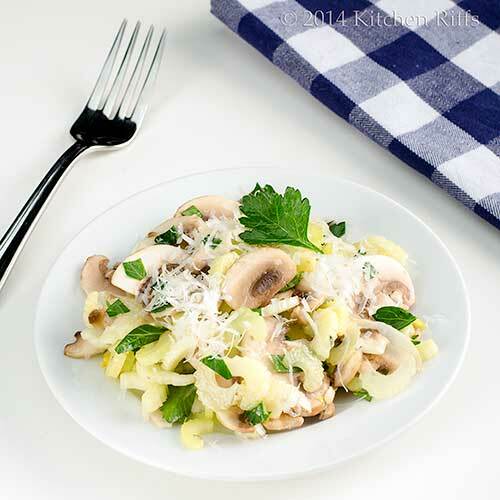 Mushrooms and celery always play nicely together when dressed with olive oil and lemon juice. But mix in some Pecorino Romano cheese, and look out flavor explosion! This salad takes just minutes to make. So it’s perfect for a weekday meal. But it’s also delectable enough for a weekend dinner party. Don’t you just love it when recipes are that accommodating? One of the best things about salads is their flexibility. Once you learn a couple of techniques and some basic recipes, you can mix and match ingredients to create endless new variations. 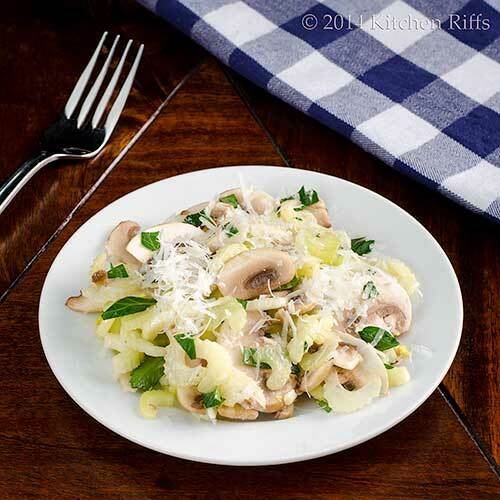 For example, this Italian Celery and Mushroom Salad is quite similar to the Spinach Salad with Parmesan that we posted about a few years ago. Same procedure, but here we substitute celery and mushrooms for spinach, and Pecorino Romano for Parmesan. I first learned about this salad years ago from reading Jeff Smith’s The Frugal Gourmet Cooks Three Ancient Cuisines: China, Greece, and Rome. He identified the dish as a specialty of the famous Savini Restaurant in Milan. Martha Rose Shulman has published a nearly identical recipe in Mediterranean Harvest, where she says the salad is a specialty of the Veneto region of Italy (which is to the east of Milan). BTW, the ingredient quantities I list here are just a guideline, not gospel. So adjust according to your taste. This recipe takes no more than 10 minutes or so to make. The recipe serves 4 (and is easily halved or doubled). It’s best made right before serving, although you can chop the celery and mushrooms ahead of time. Wash and trim the celery. Using a vegetable peeler, peel the fibrous strings off the outer part of the celery—the convex surface—if necessary (it often isn’t when using celery from the heart, though it is when using the tougher outer ribs). Cut the celery crosswise as thinly as possible (you can use a mandoline, although I never bother). Clean and slice the mushrooms: Using a damp paper towel, brush any dirt off the mushrooms (or wash and dry them if they look too dirty to clean with a towel). Cut the stems off the mushrooms and discard them (or reserve for another use, such as making soup stock). Slice the mushroom caps as thinly as possible. Add the sliced celery and mushroom caps to a mixing bowl—one large enough for tossing the ingredients properly. Drizzle in most of the olive oil (reserving a bit until you see how much is needed). Toss the celery and mushrooms until they are well coated with olive oil. Add additional oil if necessary. Juice the lemon and add most of the juice to the mixing bowl (reserve a bit until you taste the salad). Toss the salad until the juice is well incorporated, then taste. Add more lemon juice if necessary. Grate the Pecorino Romano cheese (I use a microplane) and chop the parsley. Add about ¾ of the grated cheese to the mixing bowl. Toss the salad, then add the parsley. Toss again, and taste. Now add salt and freshly ground black pepper to taste. Plate the salad, and garnish with the remaining grated Pecorino Romano cheese. Add an additional garnish of chopped parsley or whole parsley leaves, if desired. This salad is best when made with the celery heart (i.e., the pale inner ribs)—though you can include a few outer ribs if necessary. Just be sure to slice the outer ribs very thinly. Do include at least a few celery leaves in this salad—they add loads of nice flavor. You can substitute Parmesan cheese for Pecorino Romano if you prefer. But in either case, make sure you’re buying high quality imported Italian cheese. Some cooks like to shave cheese into thin ribbons for this salad. I prefer grating, but cheese ribbons taste good too (and look nice). Just to repeat myself: Use the highest quality extra virgin olive oil available to you in this salad. Better oil makes a better salad. I suppose you could substitute good quality wine vinegar for lemon juice if you’re out of lemons. But lemon juice is so good in this dish! If you want to see another take on this salad, check out Greg Henry’s recent post on SippitySup. “Who knew celery had such great flavor?” asked Mrs. Kitchen Riffs. “As we discovered with that wonderful Celery, Corn, and Bacon Chowder we posted about earlier this week,” I said. “And carrots poking it in the ribs,” said Mrs K R.
This is a beautiful looking salad and you're right about the magic ingredient being the cheese. I love slicing celery diagonally into very thin slices for salads as I find the texture and taste become more subtle and it tosses better with the extra virgin olive oil. I like the addition of mushrooms. Healthy and yummy. Hi ChopinandMysaucepan, isn't this nice? And thinly sliced celery has terrific flavor and texture! Thanks for the comment. Hi Marta, the mushrooms adds a lot of flavor, plus they look great! ;-) Thanks for the comment. I love mushrooms so this is a must try for me! Hi Ashley, isn't this so great? Mushrooms and celery make a dynamite combo! Thanks for the comment. I agree about adding some of the tender celery leaves, they have a nice delicate flavor. Hi Karen, don't celery leaves have such a pleasant flavor? I love them! Thanks for the comment. What a nice simple salad for these long winter days. It kind of gives me hope that spring will be here sooner rather than later. Beautiful colors. I can just taste it. Oh how happy my husband will be when he sees two of his favorites--celery and mushrooms in a pas de deux! I already have a soup planned and was trying to think of a complementary salad. This will be perfect, thank you so much. PS. Jeff Hall--wasn't he the Frugal Gourmet? Spectacular looking salad and so easy too. I have never had the celery leaves. Did not know they were delicious. will try soon. Hi Lea Ann, most of our snow is melted, thank goodness! Maybe this salad did the trick? ;-) Thanks for the comment. Hi Karen, this really is incredibly tasty. And really easy to make! Doesn't get better than that. ;-) Thanks for the comment. Hi Raymund, this is a nice starter -- its flavor is wonderful. And the cheese really adds some punch! Thanks for the comment. Hi Rocquie, yes, Jeff Smith was the Frugal Gourmet. And celery and mushrooms combine exceptionally well together, IMO. Enjoy! Thanks for the comment. Hi Ansh, celery leaves don't have big flavor, but their flavor is quite pleasant. Worth trying. As is this salad. ;-) Thanks for the comment. My, but your mention of Jeff Smith & The Frugal Gourmet brought back many memories of hours spent watching on Saturday mornings. This really is classic Italian. Bravo! I love celery. It has such a clean flavor, and you are so right about the tender leaves. Oh, but I cringe when I see people send them down the drain or out to the compost heap. They add so much flavor to salads and to broth.. The cremini are particularly nice here, I bet, adding as they do their own brand of earthy flavor. And buona scelta (good choice) on the Pecorino. It finishes the salad beautifully. I say complimenti! .And may I have a large portion, please! You know in Egypt we only use CELERY LEAVES, it was so strange for me to come here and find celery with no leaves!!! I was wondering why did they take the leaves off :). Very nice salad and photos. Made the from the celery heart so it is a quite flavorful salad-- plus umame mushroom and the marvelous Pecorino Romano. It is one licking-fork meal. Hi Adri, a Bravo! from you on anything Italian means so much! This is a wonderful salad. Large portions all around! Thanks for the comment. Hi Nee, sounds like a feast! Have fun! And thanks for the comment. Hi Amira, celery leaves are so often ignored here -- too bad. Thanks for the comment. Hi Denise, this really is a super salad -- such fresh, bright flavor. Thanks for the comment. John, you love your celery... and I really like that! We grow our own, have you tried that? Your recipe is outstanding! Thank you for sharing. Interesting salad. I love the taste of celery and I love mushrooms so I'm sure it's a winner for me too! Hi Lizzy, celery is fun to experiment with! We haven't tried growing our own, but should. Although we can get good quality celery at farmer's markets. Thanks for the comment. Hi Maureen, it's really a nice dish -- very fresh, interesting flavor. Thanks for the comment. It keeps its heart hidden? Very cute, John! And a very cute salad, too! I'm going to go see if I can dig some out from the bottom of the bin. The mushrooms seem to be hiding them! Hi Abbe, :-) Those mushrooms are crafty, aren't they? Thanks for the comment. Simple salads like this really make you appreciate how much celery adds to a dish. What would tuna salad be without celery, right? A veg we all definitely need to value more. Hi Carolyn, celery really doe add so much to so many dishes! Tuna salad is a prime example. And this salad, of course. ;-) Thanks for the comment. This looks great and you are so right about including the celery leaves, I think most people think of them as compost. Nice recipe John. Hi Dahn, you're probably right that most people toss out the celery leaves, alas. Thanks for the comment. Celery is a character in your story, not just an ingredient! Awesome! I don't use celery too often so I'm super glad to see a recipe that features it! Especially one with pecorino. I love that cheese! Ahhh, it's nice to see a refreshing salad. I've been tracking your blue checkered napkin that appears in most of your blogs. It seems like it's been with you for at least two years now - what a friend it's been to you! A fresh, delicous and healthy salad! This is a wonderful combination of ingredients. Aaaaannnnd now I am craving salad in a big way! Love the balance of flavors in this one! What a great salad! I love the simplicity of it and all of the different textures. I thought Amira's comment was interesting that, in Egypt the only use the leaves. I usually throw the leaves in the stock pot, but next, I'm putting them the salad! Thanks for sharing John! It will be on the dinner table soon. Hi Deepa, it is indeed a character! As are many foods. ;-) Thanks for the comment. Hi Monet, is pecorino wonderful? One of my favorite cheeses (although I admit I say that a lot!). Thanks for the comment. Hi Uru, this really is a pleasant salad -- one I think you'd like. Thanks for the comment. Hi Laura, glad you enjoy the dialog -- it's so much fun to write! Thanks for the comment. Hi Fran, that napkin is has become kind of a running personal joke for me. Plus it's a pretty effective pseudo watermark, don't you think? ;-) Thanks for the comment. Hi Rosa, isn't this nice? I'm so ready for some salads! Thanks for the comment. Hi Shashi, this really is a great salad. We can eat it and pretend the winter weather is over! Thanks for the comment. Hi MJ, I do use the leaves, although I admit they sometimes wind up in my stock pot, too. They have great flavor, though. Thanks for the comment. I love salads that are different from the norm - this looks fantastic! Hi Kristy, this is such a fun salad! Really fresh flavor, and helps chase away winter. Winner! ;-) Thanks for the comment. I am crazy about mushrooms so this salad looks A+ in my book. Hi John, this is an inspired salad! I am craving anything crunchy and fresh and can't wait to make this one. I like Mrs K R's comment to butter up the celery, too. :) I discovered how good butter and celery are together a few years ago and wish I'd known about it sooner. Thanks for sharing! Hi Pamela, this might even be A++! ;-) Thanks for the comment. Hi Hannah, butter and celery are a revelation, aren't they? Try Gorgonzola with celery too -- so tasty! Thanks for the comment. This winter weather has me seriously down in the dumps, so I need a heaping helping of this bright, fresh salad asap! Do you think I can lightly sauté the mushrooms? I don't like raw mushrooms. Otherwise, love the simple flavours of the salad. It's funny, as cold as it is, I've been craving salad a lot lately. Also, I remember Jeff Smith, I enjoyed watching his shows, he was pretty good. Hi Laura, this should cheer you up! It has a nice, sunny flavor. ;-) Thanks for the comment. Hi Nazneen, I've not done that, but it sounds like an interesting idea. Certainly worth a try! Do let me know if it works. ;-) Thanks for the comment. I love the flavors in this salad! So gorgeous-looking too! Hi Peachy, isn't this nice? And tastes great, too! Thanks for the comment. Que rico se ve su ensalada me encanta esta combinaciòn,abrazos. I was never a fan of raw celery until I discovered peeling/destringing/whatever you want to call it. It totally transforms it. And you don't see that many recipes for raw mushrooms. It's so hard to construct a great salad this time of year and I can't wait to try this.Thanks. Hi Rosita, isn't this a nice combo? So tasty! Thanks for the comment. 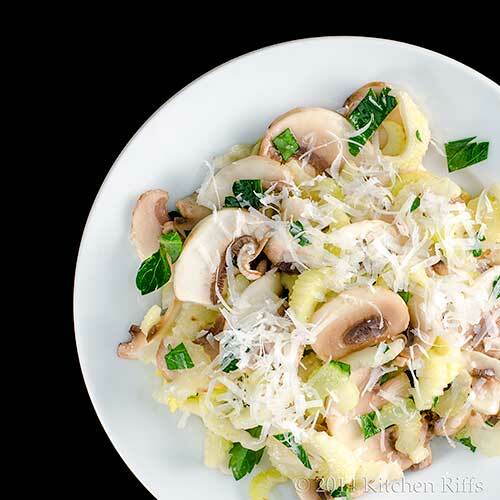 Hi Jeri, this really is a good salad for this time of year -- celery and mushrooms are always good quality, even in winter. This is a nice recipe -- I think you'll enjoy it. Thanks for the comment. I love mushrooms and eat lots of them, usually as part of the sauce for the main dish. Love that you're using them in a salad! 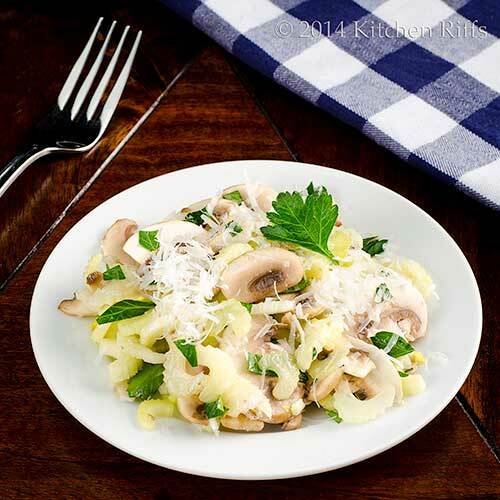 Mushrooms covered in grated cheese plus the veggies is a pure delight! Hi Julia, pure delight is a great way to describe this salad! ;-) Thanks for the comment. I love that you can make a delicious recipe from such simple ingredients. Thanks for the idea, John - maybe I can share the love with the celery in the bottom of my own vegetable bin. Wow - this looks like a wonderful salad, John. I love those flavors and the combination just sounds so tasty - definitely something I am going to give a try! Hi Kiran, this dish definitely has me craving warmer weather! It's good in any season, though. Thanks for the comment. Hi Beth, this really is a wonderful dish! And it's classic Italian fare -- it takes simple ingredients (and just a few) and showcases them. Thanks for the comment. Hi Donalyn, you won't be sorry you tried this! It has such a bright, fresh flavor. And did I mention it's tasty? ;-) Thanks for the comment. Hi Greg, I know that you know what a great dish this is! Thanks for the comment. Hi Julie, this is a great salad! Perfect for any season of the year. Thanks for the comment. Made this tonight and it is so good! A total hit with my family. Thanks again, John! The good cheese does make a huge difference doesn't? Once in a while, if I'm making a good soup or a really good sauce for pasta I will get the good stuff at whole foods to further complement the meal. Hi Dawn, the good stuff is so worth it! Much more flavor, IMO, and a mouthfeel that is wonderful. Thanks for the comment. I'm never sure what to do with celery so I love this idea! Now this is a inviting salad which I haven't tried yet. The best part is that ingredients can be added or removed and it only takes 10 minutes. John, this is going to be a live saver in the future here. ;) Thanks for sharing and I wish you a lovely weekend! Love this recipe. Looks so delicious! Hi Caroline, I was never sure what to do with celery either, until I went looking for recipes! Turns out there are a lot, and this is one of the best. Thanks for the comment. Hi Helene, this salad is so good! I'll bet that once you make it, you'll make it often. ;-) Thanks for the comment. Hi Asmita, it is delicious, it is! ;-) Thanks for the comment. I just received a bunch of celery in my CSA, perfect for this light and refreshing salad. We don't use celery often, other than in soups and stews. I love the idea of making it the star of a salad. Hi Kristi, this dish is totally the sort of thing you often prepare! Really worth making. ;-) Thanks for the comment. 10 minute recipes, with a cast of ingredients that go so well together? Magic. Wonder! Hi Kitchen Butterfly, isn't this nice? Magic indeed! Thanks for the comment. Hi Alex, isn't this nice? So tasty! Thanks for the comment. This reminds me of Dorie Greenspan's White Salad we made last week. I love the addition of Romano...mine needed that! Hi Liz, I know the White Salad recipe but never made it -- for some reason the apples just don't seem right. This salad is much more basic, and truly good. Really worth trying. Thanks for the comment. Hi Ray, I really like simple salad dressings. It works great with this salad, though -- just enough flavor. Thanks for the comment. Hi Lynn, celery and mushrooms really go together extremely well. Add some salad dressing and a nice sharp cheese? Bliss! Thanks for the comment. Oh yum!! I have never heard of this salad but now I really want to taste it. Thanks for sharing John! A sprinkle of parmesan cheese in this dish makes it all come together beautifully. Simple and easy recipe and fancy enough for dinner guest. I always usually have celery in the refrigerator so this is a great idea for those tender inside stalks that usually get saved only for soups and stir fries. Thanks for the great recipe. Hi Nancy, this is a wonderful salad -- loads of fresh flavor. You'll like. ;-) Thanks for the comment. Hi Bam, a little cheese helps so many dishes, doesn't it? This really is a wonderful dish for celery hearts. Although stir-fries are pretty darn good too! Thanks for the comment. Hi Charlie, celery leaves really do add great flavor, don't they? We had some really warm weather the last few days, but alas, the dread polar vortex is returning! But spring will soon be here. ;-) Thanks for the comment. This salad looks wonderful. Celery add so much to a salad. Hi Dawn, this really is a terrific salad! So much flavor, and great texture. Thanks for the comment. I find that celery is good for exercising one's 'choppers' - nice. crunchy texture that gets your jaws going. My favourite is plain celery with cream cheese in the middle. Hi Fran, celery with cream cheese is a great combo! Try it with Gorgonzola, too -- even better IMO. Thanks for the comment. Delicious looking salad. I don't use celery as a main ingredient nearly enough. You've got some great celery recipes and you're inspiring me to use it more. Great post, John! Hi Bill, glad you like this recipe. Celery really doesn't get enough love. Time to change that! Thanks for the comment. Hi Aurica, this really is good stuff -- definitely worth trying. Thanks for the comment. I've been really excited reading your posts about celery (although reading from the latest). You introduced and inspired me with new dishes that I'd love to try with celery and this is going to appear on our table tomorrow. I have all the ingredients AND haven't tried this combination before. How fun! I'll surely enjoy this new salad! Hi Nami, you'll love this! Really pure, clean flavors. Great texture, too. Thanks for the comment.